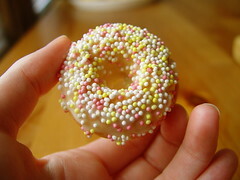 Remember when I made mini-donuts and promised you a recipe? And then never gave you one? Well, today I decided to keep my word. I got up, made some tea, and set to work. My house is covered in donuts! My first attempt wasn’t a complete failure, but I wasn’t happy with the result. They didn’t rise very well, leaving one side of each donut flat and craggy. It’s not that I expected a recipe I made up to work on the first try, but I was still hoping to get lucky. Much better, huh? 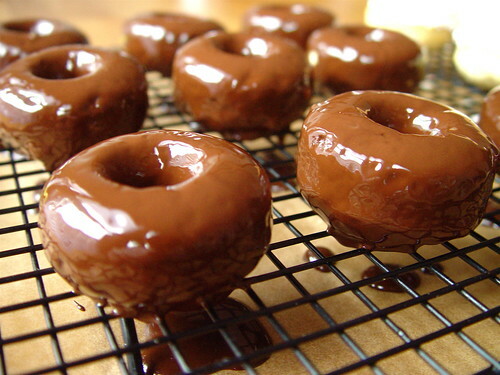 Below is the recipe for the donuts and the glaze, directions for glaze, pictures of the whole process, and even a video. Oh, and did I mention? There’s chocoalte coated ones, too! In a large bowl, combine dry ingredients with a whisk to mix thoroughly. Combine wet ingredients in a small sauce pan over medium low heat and mix until earth balance is melted. This mixture should NOT get too hot, you should be able to stick your finger in the mixture. It should feel slightly warm. If you burn yourself, 1) it’s not my fault! and 2) it’s too hot for the dough! Click for photo of the same. 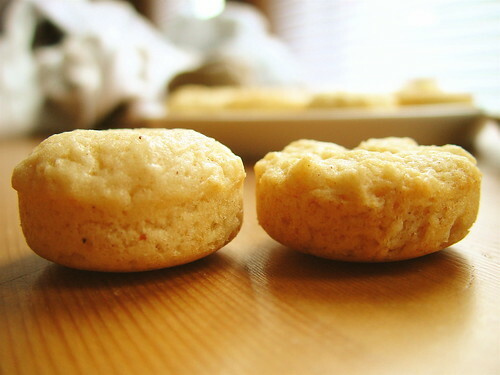 Using a tablespoon measure, scoop out dough into your ungreased nonstick mini-donut pan. 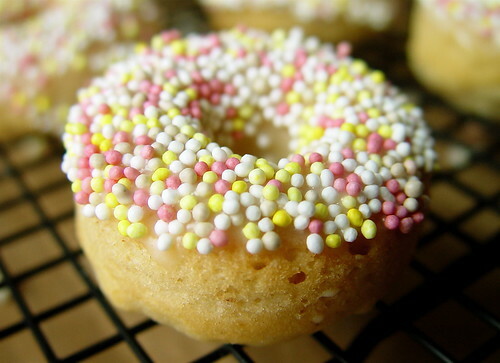 Smooth out the top of the dough with your fingers, this will make for more even, prettier donuts, but isn’t crucial. 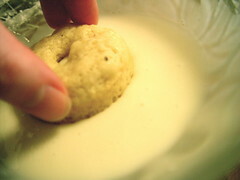 As you can see, the dough sits just below the rim. If you over fill, your donuts will come out looking like it has a little muffin top. Not the end of the world, but not very donut-like either. Bake for 12 minutes. 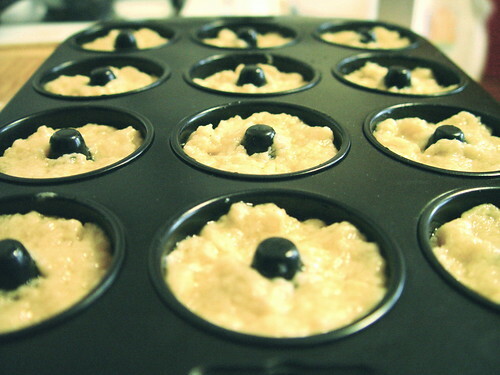 They should not be browned on top, but a tester will come out clean. Invert hot pan over a cutting board or cooling rack to release donuts. Allow to cool completely before decorating. Whisk soymilk and powdered sugar together. 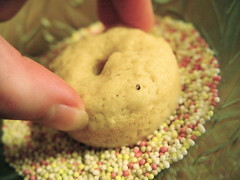 Dip the “bottom” half of the donut (the side with the nicer shape) into the glaze, let some drip off, then dip glaze-side down into sprinkles. Transfer to a wire rack that has been set on top of some parchment paper. 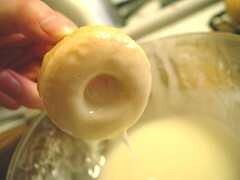 The excess glaze will drip through the rack onto the paper for easy cleaning later. This is the easy part. Melt 6 oz of high quality fairly sweet chocolate over low heat in a double boiler. Remove from heat and stir until chocolate is smooth and barely warm to the touch. I should mention that you should be very careful not to get any water in the chocolate or it could seize, and no one likes that! 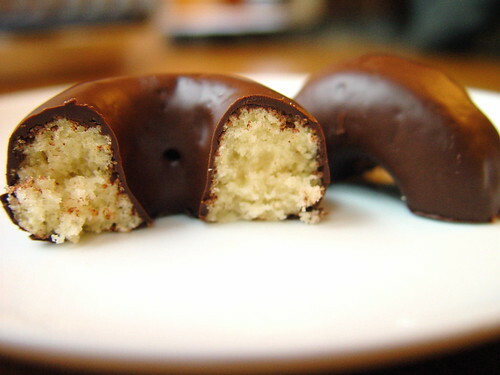 Dip your donuts one-by-one into the chocolate until completely covered. Place donut on your wire rack to drip off excess chocolate – it’ll make for a much smoother appearance than if you try to scrape off excess chocoalte with your fingers. Allow to set until chocolate isn’t so shiny and can be picked up without making a sticky mess! *Edit!! So, I waited until the chocolate was set and realized that my donuts had glued themselves to the rack, making the bottoms rip off when your try to pick one up. I think it’d be better to let these set on parchment paper! Also, use a decently sweet chocolate, mine was too bitter. Thank you so much, I’m finally going to eat vegan donuts! My son can’t do soy or apples. Would Rice Milk and Regular or Balsamic Vinegar work in place of the soy milk and apple cider vinegar? I think so. Maybe try something thicker like almond or coconut milk. Good luck! Balsamic would taste terrible! Rice vinegar has a great mild flavor. is there an alternative to making the doughnut holes? ?